Continuing on our quick and easy homemade gluten free alternatives today we will talk about almond flour. Just like brown rice flour, almond flour is a commonly used gluten free flour that also comes at a premium to buy in the store. So the solution, of course, is to make it at home! It is seriously just as simple to make as the brown rice flour, with just one small extra step of caution. The other awesome thing about almond flour is that you can make it just as easily in a food processor, for all of you non-vitamix folks! 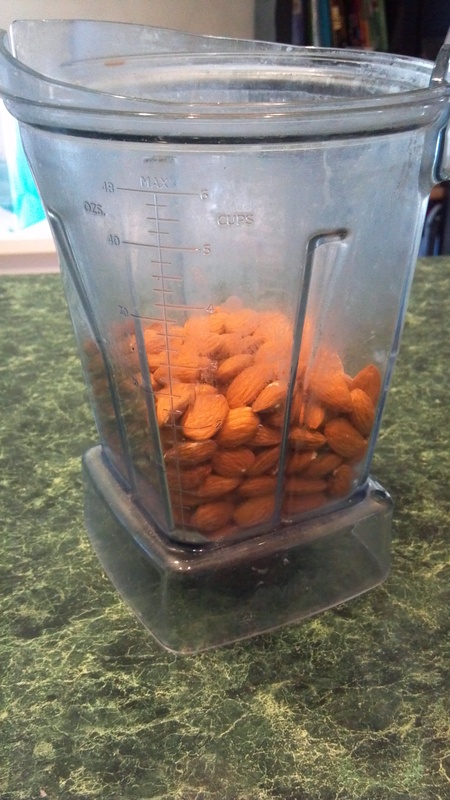 1 – Locate your almonds. I store mine in the fridge. 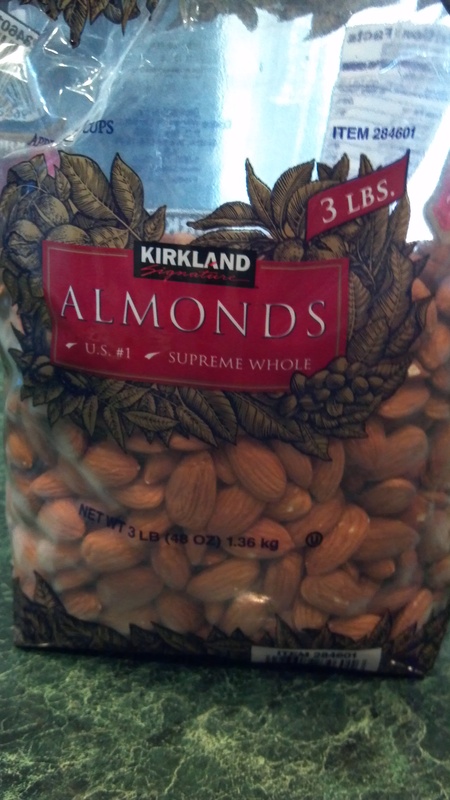 We buy these almonds at Costco. I think they’re about $10 a bag. You can also use blanched almonds for a smoother flour. 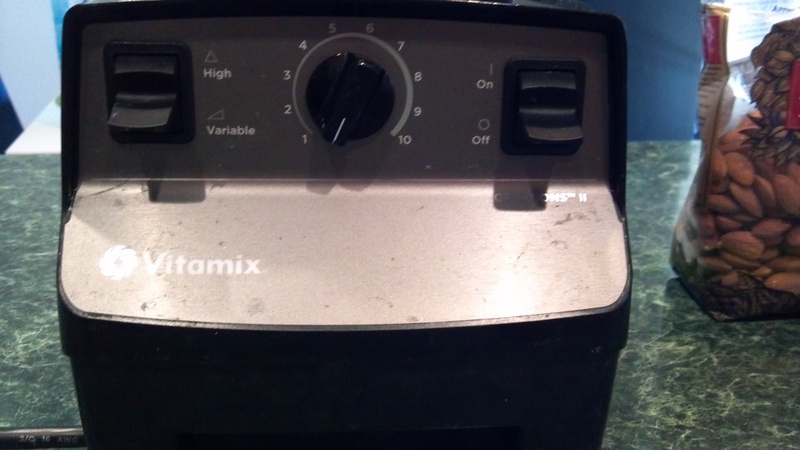 2 – Put about 1.5 cups into your vitamix or food processor. I think I have 2 in there. It was a bit much. A food processor could probably handle more. 3 – Using our method used in the brown rice flour, we will slowly increase through all of the variable speeds, then up to high, then off (in the food processor just turn it on high for a few seconds and then off). 4 – This is where you need to be careful. Between each blending session you need to stir all of the contents very well. Get everything out from around the blade. 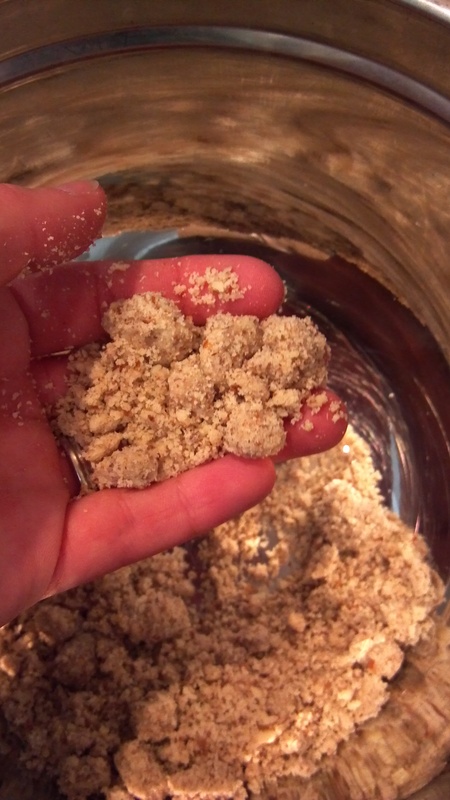 You will continue to go through step 3 until you have a nice crumbly-flour like consistency. But do not overdo it…unless you want almond butter instead of almond flour which isn’t a terrible mistake…and still tasty but not what we’re aiming for! I usually do not stress about getting every little piece ground up. If I see a big piece when I’m using the flour I just pick it out. 5 – Lastly, put it in a Mason jar and store in the fridge …Or… use it right away like I did! Now, Nathan eats a more traditional vegetarian diet, but since I avoid artificial sugars so much, he has too for the most part just for simplicity’s sake, and so he’s gotten to where he enjoys foods with more natural sugars more than artificial sugars as well. We are going up to my parents for dinner tonight, to celebrate Nathan’s birthday as well as my brother’s birthday (which was last week), and since my mother eats a gluten free diet as well, I decided on a gluten free, natural sugar dessert to take along. I made the recipe as in Brittany’s post, but I did substitute 1/3 a cup maple syrup for the granulated sugar, and left out the milk. 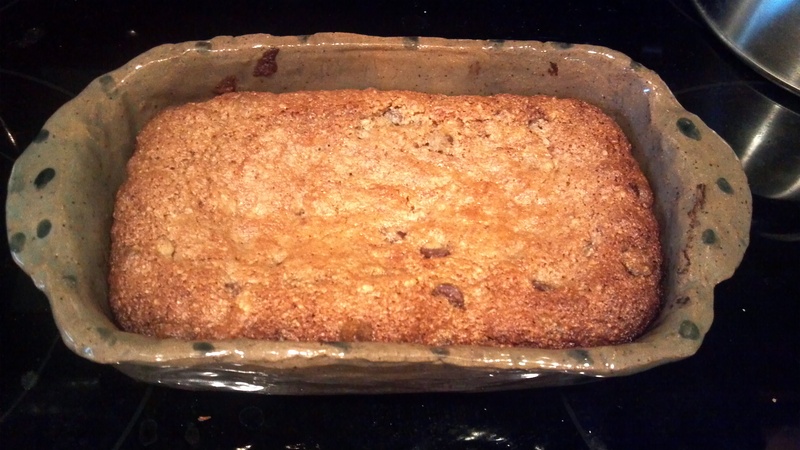 It’s baking right now, and smells delicious! Have you ever used almond flour? I’d love to hear about it!